27 year-old female with no medical history presenting with neck swelling. She describes one month of progressive enlargement of a left-sided neck mass, and in the past two weeks has noted a new right-sided neck mass. This has been associated with worsening dysphagia to solids, describing a sensation of food lodging in the mid-chest and requiring liquids for passage – she attributes her recent 10lb weight loss to this. She also reports a non-productive cough for the past two weeks and generalized fatigue. She otherwise denies fevers, night sweats, chest pain, shortness of breath, nausea/vomiting, or changes in bowel/urinary habits. She has no known sick contacts or TB exposure risk factors. She has no medical history, no prior surgeries, does not take any medications and denies tobacco, alcohol or drug use. Gen: Well-appearing young female, in no acute distress. HEENT: PERRL, EOMI, MMM without lesions. There is a 2x3cm firm, non-tender, mobile left supraclavicular lymph node, as well as two 1x1cm firm, non-tender lymph nodes in the left and right anterior cervical chains. CV: RRR, normal S1/S2, no murmurs. No JVD. Lungs: Clear to auscultation bilaterally. There is a transition to bronchial breath sounds along the trachea inferior to the sternal angle with normal tracheal sounds superiorly. Abd: Soft, non-tender without organomegaly. Ext: Warm and well-perfused with normal peripheral pulses. No axillary or inguinal lymphadenopathy. Neuro: Alert and oriented, responding appropriately to questions. PERRL, EOMI, facial sensation symmetric, facial muscles symmetric, hearing grossly normal, palate rises symmetrically, tongue movements normal without fasciculation, SCM/trapezius normal. Normal FTN, RAM. Gait intact. Peripheral sensation and motor grossly normal. Anterior mediastinal mass with a wide differential - likely represents lymphoma or germ cell tumor. Less likely thymic or thyroid origin. 27F with no PMH presenting with progressive localized lymphadenopathy. Resultant dysphagia, cervical and supraclavicular distribution as well as abnormal tracheal sounds concerning for mediastinal involvement. The patient is currently stable without evidence of airway compromise. 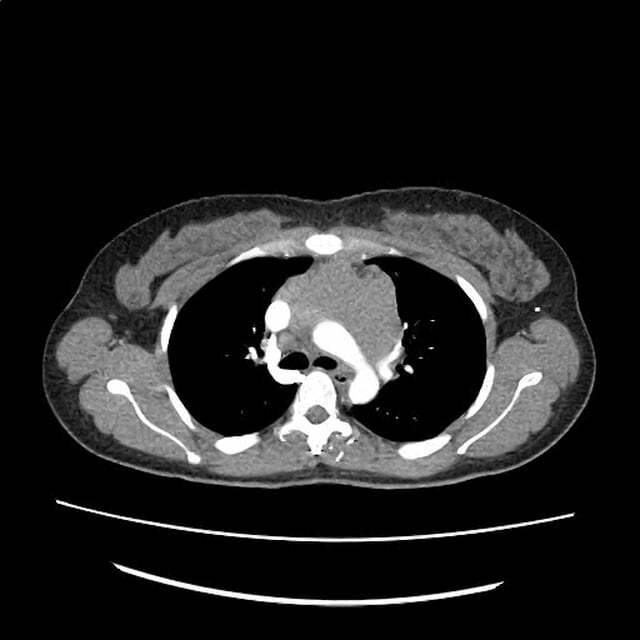 A CT of the chest was obtained to evaluate for thoracic malignancy, which showed a large anterior mediastinal mass concerning lymphoma or germ cell tumor. 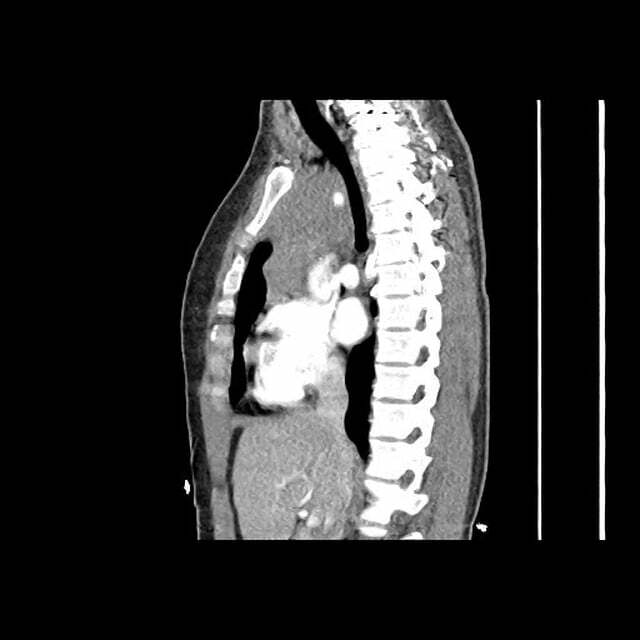 The location of the mass likely explains the patient’s dysphagia due to compression of the esophagus, as well as the abnormal pulmonary exam with compression potentially irritating the trachea and triggering her non-productive cough. The patient was admitted for further workup. This case applies the differential diagnosis of lymphadenopathy. The most abnormal finding on examination was non-tender, left supraclavicular lymphadenopathy. The duration of symptoms and lack of tenderness is concerning for malignancy, and the left supraclavicular location suggests a thoracic or intra-abdominal source.